Beauty and the Beast has always been one of my favorite fairy tales–probably because the retellings are so good. If you go back to the original story, it’s almost as flawed as any other traditional fairy tale. But the retellings…are SO good. Beauty by Robin McKinley is a particular favorite of mine. The basic story is familiar, if you’ve read the original or even if you’ve seen the Disney movie. From the Disney movie you’ll recognize the part about the terrifying Beast living in the castle in the woods. A lost traveler spends the night and, upon offending the Beast, agrees to bring back his daughter, Beauty, to stay at the castle. From the original story you’ll recognize the part about Beauty’s father being a rich merchant who lost his fortune, forcing them to move out to the country. And Beauty had two sisters as well, and it was Beauty’s request for a rose when her father began his ill-fated journey that, in a way, put everything else in motion. I think I read Beauty before I read the original fairy tale, so when I did read the original, I kept thinking, “oh, now I see where McKinley got that detail or this part from!” But, like any great fairy tale retelling, McKinley has taken the slender original story and embroidered and expanded upon it, bringing the characters to life and explaining the bits that never quite made sense. Beauty’s father and two sisters are very real characters, and the tragedy of going to the Beast’s castle is as much about leaving them as it is about going to an unknown fate with a monstrous Beast. How a rich merchant family makes their way in a country village is a detailed and developed part of the story. Beauty and the Beast are my favorite characters though. Beauty, like the original and the Disney version, loves to read. She’s also ugly, or at least considers herself so (not something from either version). I LOVE that element. If you read enough fairy tales, breathlessly beautiful heroines get very old. They’re all very much the same, sweet-tempered and beautiful and sickeningly good. So I love McKinley’s scrawny, mouse-haired, stubborn-minded Beauty–a name she picked up as a child and has been too embarrassed to request dropped. The Beast is charming, sometimes unsure of himself, and really rather sweet. I thought the romance was very cute. My other favorite part is probably the castle itself. It’s enchanted, of course, but there’s a wonderful practical side to the magic. Beauty has a couple of enchanted breezes (sort of) attending to her, and in personality they’re quite fussy and straight-forward and focused on common sense. And I’m so very, very amused by enchanted candles that light themselves–and sometimes have to admonish each other, “Hsst–wake up, you” when one of them doesn’t light. 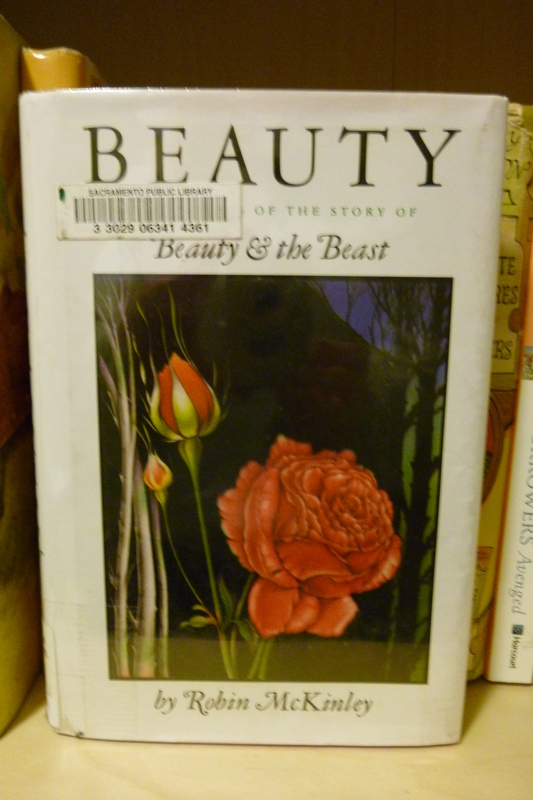 Robin McKinley wrote another retelling of Beauty and the Beast called Rose-Daughter which, despite following the same basic plotline, is quite different (a lot more roses, for one thing). It’s very good also, but much more surreal. The magic, and even the non-magical characters, like the two sisters, feel less real-world to me–not unrealistic, exactly, but not so realistic either. I recommend it too, but personally I prefer the more grounded Beauty. But by all means, read both. Or either. Or pretty much anything else by Robin McKinley, because I can’t honestly say I’ve met a book by her I didn’t like. Beauty may be my favorite, though. Interesting how an author can take a beloved and well-known basic story and add so much to it that is unique and creative, to bring elements of the story alive that otherwise wouldn’t be told at all. Thanks for the recommendation. That’s exactly what I love about fairy tales retold–familiar elements, told in a new and unique way. An excellent post on an excellent book! I still haven’t read Rose Daughter, so I appreciate the reminder about it too. I think the most fascinating part of Rose Daughter may be that the same author wrote another novel with the same basic premise…and yet it’s such a completely different book! I love this book! I should re-read it, I haven’t read it in years. So good! I think I’ve read Beauty a minimum of three times. And I still enjoy it. I hope you find it’s one that’s still enjoyable when you go back to it!